Roof Moss Removal | NW Surface Cleaner, Inc.
Spring is upon us and that means its time for spring cleaning. This year the ritual should extend to your roof’s surface where after an extremely wet winter, there is likely moss growth. Proper roof moss removal will extend the life of this surface, as well as add to your home’s curb appeal. Moss spores land and attach themselves to your roof using the damp shady surface to reproduce. Moss growing on the ends of roofing shingles may seem harmless. However, over time will begin to deteriorate this material, as well as lift shingles, trapping moisture underneath your roof and increasing the likelihood of getting a leak that ultimately damages the structural integrity of your roof. 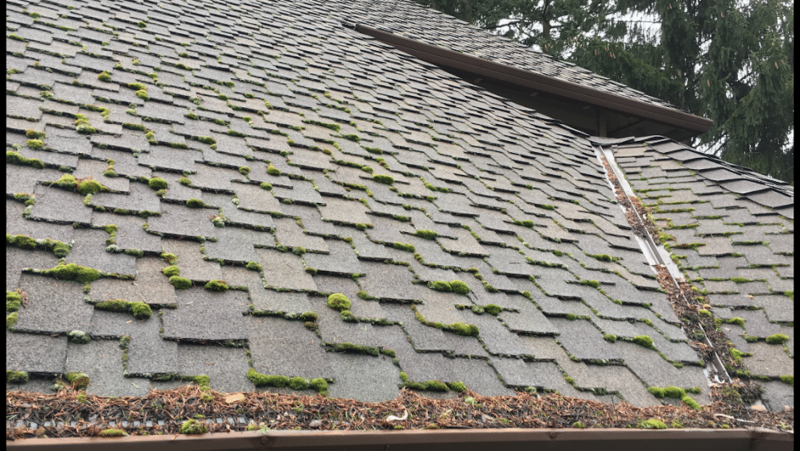 Whether you have a wood, tile or composition roof, it is imperative that the moss is properly removed without damaging the roofing material because ultimately the goal is to extend the life of your roof! We use the most gentle method to keep your roof clean by hand scraping to remove the moss, and then air blowing the roof. Remember, maintenance is cheaper than neglect, and spending the money to properly have the moss removed can go a long way in protecting the roof over your head. Nice post, we also provide this service at affordable prices.